Cello wrapped. Your mix of lollipop colours - Red, Yellow, Blue, Green, Orange, Purple. Blue - Tutti Fruiti, Green - Lemon, Orange - Orange, Red - Strawberry, Purple - Grape, Yellow - Lemon. Each lollipop, approx 6 grams. Approx. 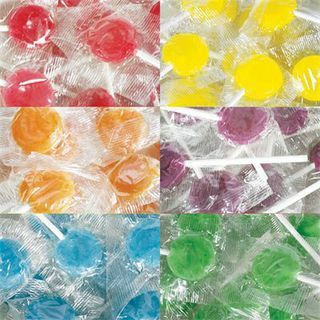 160 lollipops per kilo.